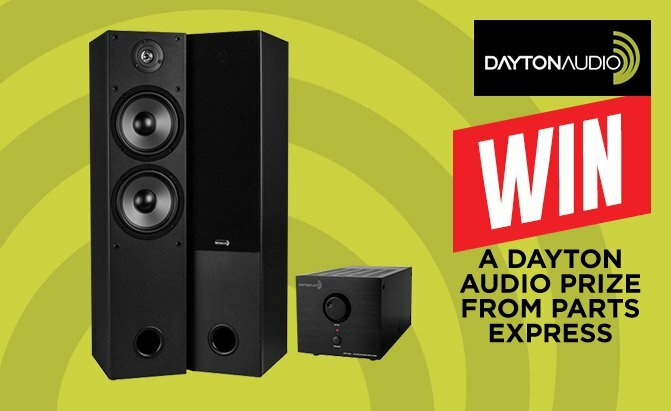 Home Theater Forum and Systems - HomeTheaterShack.com > General Shack Area > Home Theater, Audio and Video News > Win a Dayton Audio Speaker Package from Parts Express! Win a Dayton Audio Speaker Package from Parts Express! Parts Express is giving away a pair of T652 tower speakers and an APA150 stereo power amp from Dayton Audio, so what are you waiting for? Enter today! Dayton Audio speakers are very popular on Home Theater Shack, and for good reason. They provide great performance at surprisingly low cost, making them an exceptional value. In fact, the only thing better than paying so little for such great speakers is to get them for free—which can happen to you if you enter our sweepstakes! Parts Express is giving away a Dayton Audio speaker/amp package (total value $258.76) by random selection. The prize package includes two T652 tower speakers and an APA150 power amplifier. To enter, all you have to do is fill out the simple registration form here—no payment or purchase of any kind is necessary to enter or win. You don't even have to be a member of Home Theater Shack—though joining is also free and easy, and doing so lets you participate in over 71,000 online conversations about all things audio and video with over 171,000 members. The contest period extends until July 31, 2018, after which one entry will be selected at random to win a pair of Dayton Audio T652 tower speakers and APA150 power amp from Parts Express. So, what are you waiting for? Go to the registration form, fill it out, and cross your fingers. Who knows? You could find a pair of Dayton Audio T652 tower speakers and APA150 power amp from Parts Express delivered to your door! To learn more about Dayton Audio, click here. To learn more about Parts Express, click here. P.O. Box) to receive the prize which will be shipped free of charge. its or their sole discretion. HomeTheaterShack.com), 111 Peter Street, Suite 700, Toronto, Ontario, M5V 2H1. Re: Win a Dayton Audio Mobile Speaker Package from Parts Express!